AMD has released a new beta driver for Radeon HD 5000/6000/7000 as well as for mobilityx HD 5000/6000M/7000M. Catalyst 13.3 beta2 improves performance in Sim City 5 (16%), Far Cry 3 (5%) and brings some bigfixes for Tomb Raider with TressFX enabled. Catalyst 13.3 beta2 is an OpenGL 4.2 driver (exact version: 4.2.12172) and exposes 255 OpenGL extensions for a Radeon HD 7970, 251 for a Radeon HD 6970 and 250 for a Radeon HD 5850. - CL_PLATFORM_VENDOR: Advanced Micro Devices, Inc.
- CL_DEVICE_VENDOR: Advanced Micro Devices, Inc.
so seems deleted extensions are 7xxx series and because you are using 5850 now vs 7xxx before? can someone with 7xxx confirm? Yeah, GL_EXT_depth_bounds_test should only be supported on Radeon HD 7700 and later chipsets, because that’s the first AMD hardware which can actually do it. Also, I think GL_AMD_sparse_texture can only be supported on Radeon HD 6900 and later chipsets. I can’t speak for the other extensions, I haven’t read the specifications yet (if they even exist). Source: I work on the open Radeon drivers. 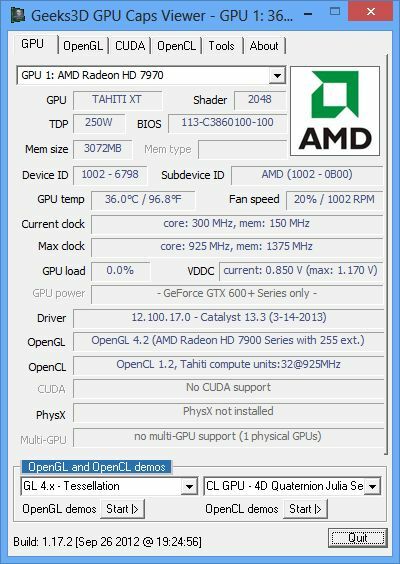 Thanks guys, I updated the GL list for HD 7970, HD 6970 and HD 5850.